House Democrats on Tuesday failed to garner the votes needed to override President Trump’s veto of a bill blocking his emergency border wall funding. Only a handful of Republicans crossed the aisle to vote with Democrats on the 248-181 vote. 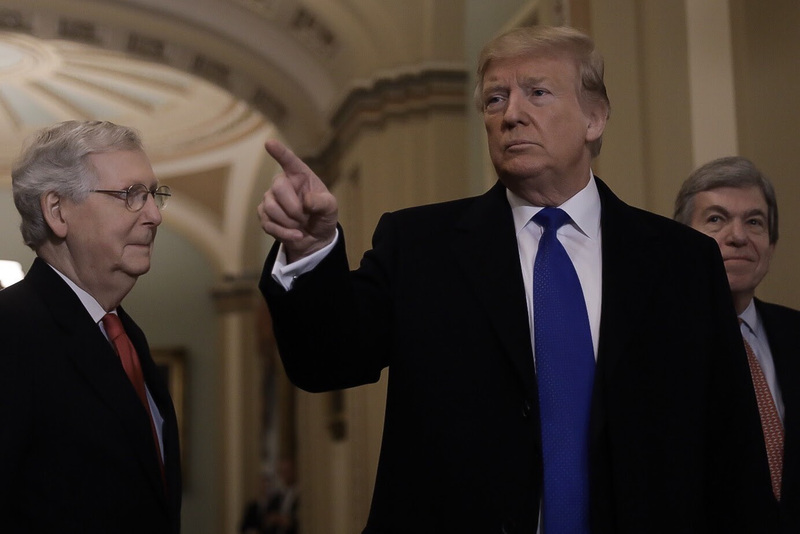 That deprived the measure of the two-thirds majority needed to revoke Trump’s February emergency declaration that authorized him to move $3.6 billion in military funds to a southern border wall project. This is as the White House, the Trump Campaign and Social Media has been abuzz in the aftermath of the Attorney General's Summary Findings our team released earlier. The US Senate Majority Leader blocked a Democratic Attempt to publicly release the report. The Justice Department made another major move under the Attorney General in noting that the Affordable Care Act must be held unconstitutional. Implemented tariffs that have caused U.S. companies significant hardships. And then criticized those companies, by name, for moving or closing down plants in response to the economic forces he set in motion. Endorsed accused ephebophile Roy Moore in an Alabama Senate race. Got his ethically compromised son-in-law security clearance over many, many objections of the American intelligence world. Dragged his feet on federal relief for Puerto Rico after Hurricane Maria in 2018. Insulted John McCain upon his death by ordering flags raised from half-staff after just one day. Promoted conspiracy theories about shadow-banning on Twitter. Needlessly separated thousands of children from their parents at the southern border and then lied about it being an Obama-era policy. Endorsed the racist Steve King in Iowa. Mocked Republicans who lost in the midterms who weren’t supportive enough of him. Celebrated that the wall Mexico wasn’t paying for was being built. (It wasn’t). Threatened North Korea with nuclear war, via Twitter. When that proved not true, said he was in no hurry for the Norks to denuclearize. Called Kim Jong-un his friend. Badgered his attorney general for months, fired him, and replaced him temporarily with a man who sat on the board of an “invention-marketing” company that scammed clients out of millions of dollars. Defended Mohammad bin Salman in the wake of the Saudi regime’s murder of U.S. permanent resident and Saudi dissident Jamal Khashoggi. Said after the failed summit with North Korea that he believed Kim Jong-un when Kim said he had nothing to do with the death of Otto Warmbier (whose parents Trump had invited to the 2018 State of the Union back when he was in the threatening-nuclear-war phase of his North Korean relationship). Drove away defense secretary James Mattis with a unilateral surprise announcement that he wanted America to withdraw from Syria. Shut down the government for 35 days because Congress would not give him money for the wall, which Mexico wasn’t paying for, and that he had (falsely) claimed was already under construction. Made an unprecedented executive power grab by declaring a national emergency so that he could appropriate money for the wall from the military to build the wall Mexico wasn’t paying for. Insulted John McCain again and complained he didn’t get a thank you from McCain’s family for approving of the war hero’s funeral. Complained about sending extra food stamp money to the people in Puerto Rico who are still recovering from Hurricane Maria. Created confusion by seemingly canceling, via Twitter, sanctions against North Korea less than a day after his own Treasury Department announced them. It was said that Socrates saw his difficult marriage as a sort of challenge that life threw at him—that the fact that his wife’s personality and interests were often at odds with his own was something he could be made better by for being patient with. Certainly, Marcus Aurelius was tested by his difficult son, and likely spent many sleepless nights worrying about what would become of this boy who just couldn’t quite get it together. So, too, are each of us tested by the difficult relationships that life throws our way. For some of us, that’s an absent father, for others, it’s a sister with a drug problem. We have co-workers who are drama queens, bosses who are assholes, and neighbors who are meddlesome. Each of these situations is a trial, one that challenges us and forces us to apply the lessons that we’ve learned in our reading and through our studies. Can you learn how to love someone who has trouble loving back? Can you learn how to forgive someone for their flaws? Can you develop the self-control necessary to not lose your temper when they provoke you? Can you put up appropriate boundaries? Can you say “No” when it’s appropriate and say, “Yes” when someone really needs you, even when it would be easier to focus on your own needs? Relationships test us, but they also teach us. They bring with them both obstacles and opportunities. What matters, then, is how we respond and who we become in the process. No one ever said that family or friendships would be easy—they just said the trouble would be worth it in the end.